The Chestnut Lodge is a three bedroom, two and half bath - 2,000 sq. foot secluded log cabin that sleeps up to 11 people. 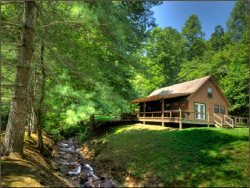 Located in the Deep Creek Community, just half a mile from hiking trails, fly fishing, tubing, tubing, swimming, and horseback riding. With all this in mind, you may never want to leave the tranquil setting right at your cabin. The Chestnut sits right on a small private pond with a beautiful 50 ft. waterfall that is for your enjoyment alone. Sit back and relax on the pier and enjoy the beautiful sounds of the waterfall. If you'd rather roast marshmallows in the fire pit area or take a dip in the hot tub, all of this is there for your enjoyment as well. Three bedrooms are enclosed - the fourth is in an open area without a door. At the Chestnut Lodge, room is not something you will run out of with 3 bedrooms, 2 1/2 bathrooms, there is plenty of room for your entire party to spread out and relax. In one of the great rooms you will find a beautiful wood burning, rocked fireplace,and TV with satellite service, DVD player. The second great room features a pool table and an old-time franklin stove. The fully equipped kitchen has been completely renovated with quartz counter tops, stainless steel appliances, and many oversized pots and pans for cooking large family meals. In addition to the large gathering areas, there are two bedrooms, each equipped with one queen size bed, the third bedroom has one queen bed and one single bed. There is also a third room set up as an additional bedroom with a queen size bed. The Lodge is located just minutes to downtown Bryson City, where you can enjoy the Great Smoky Mountain Railroad, dining, and shopping opportunities. In just a 15 minute drive you can enjoy the Cherokee Indian Reservation, Harrah's Cherokee Casino, and the entrance to the Great Smoky Mountain National Park where you will find many beautiful scenic drives, hiking trails, waterfalls, and more. In just a 20 minute drive you can enjoy all the Nanatahala River Gorge has to offer, including whitewater rafting, kayaking, ziplining, horseback riding, fishing, and hiking. Beautiful outdoor area including pond, pier, 50 ft. waterfall. Hot tub, fire pit, & charcoal grill. Indoors you will find pool table, TV with satellite service, DVD player, CD player, full kitchen, 4 Queen sized beds, 1 twin bed and a sleeper sofa. Washer/Dryer. Working with the team was a wonderful experience, very helpful and knowledgeable. We stayed at the Chestnut Lodge, very nice and peaceful. Looking forward to making a return trip. It had everything we needed plus more. The team was very helpful and knowledgeable. We had a great time, from the youngest (a four year old) to the oldest (61 year old). Everyone was very helpful and accommodating. Alice was amazing to work with and did everything to make sure our stay was wonderful. The waterfall was great, to sit on the porch and just listen to it, was so relaxing, the hot tub was relaxing also, we built a fire inside on night after a long day of site seeing. I will definitely be back!!!! did not want to leave!! We loved staying at this cabin! Staff was helpful and friendly. We were VERY pleased it was comfortable and room enough for the family God Bless. The property was lovely, close to so many interesting activities. The only thing missing was more time! Awesome place to stay! Definitely will be back! The entire process was flawless. We enjoyed our stay. The property was perfect for our needs. Everything was just as it was described and met our needs perfectly. Friendly and completely willing to help with a request and answer our questions. Chestnut Lodge is a wonderful cabin that was equipped for all the amenities for to keep my entire family happy for a week stay. The cabin is breathtaking and the location with partly secluded with beautiful views from all windows.